You scream, I scream, we all scream for ice cream! Am I right? I know I do, especially in the warmer months ahead of us. After all, what is a better treat for those dog days of summer than good ole ice cream? No matter what shape or form, it is always a crowd pleaser. Before I get to my recipe inspiration, I want to know if you are up for a challenge! This SWEET challenge can win TWO of you a GRAND prize of $2,500 USD. That can get you a lot of ice cream, a new TV or a nice chunk of cash to use however you please. Voortman has been a household name in our family since we can remember. The wafers especially, my parents would always have our house stocked with them. They’re crispy, perfectly sweet, light and make a delicious snack. They’re really versatile and great to use in recipes. Now your childhood snack can be converted into an adult version of delicacy. But, if you want to make a fun creation with your kids–that’s okay too! Voortman is prizing $2,500 USD to two lucky and creative winners! 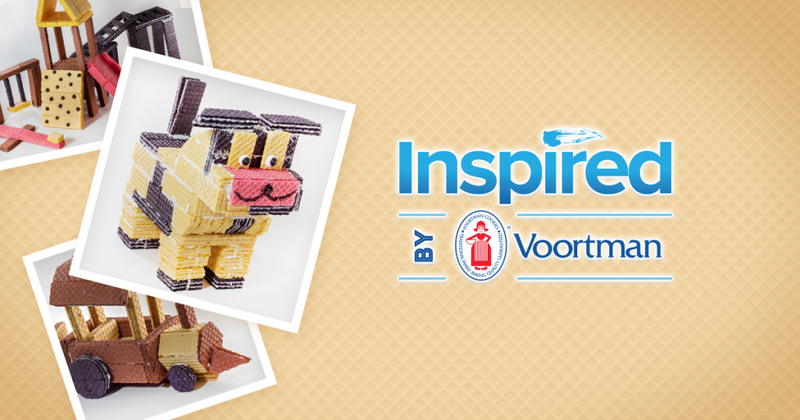 They want to inspire you to come up with a wafer creation made by using Voortman wafer cookies. The contest is open to Canada and the US and closes on June 16th, 2016 at midnight. You can enter, here. There are two categories to participate in, either the recipe or structure category. A wafer structure is an object or piece of original artwork (that does not violate any copyright laws) made out of wafers. Wafers must be visible in the creation, and ideally should make up the majority of your creation. A wafer recipe is a wafer-based dish or treat intended for eating. Wafers must be visible in the creation, and ideally should make up the majority of your creation. • Wafers must be a primary ingredient or inspiration for the creation. You do not need to include a list of ingredients or steps to reproduce the creation in your entry. I love to bake and whenever I get a chance to do it, I do. I find it therapeutic and it’s fun to create something with your own two hands. Plus, when you’re finished, you have something sweet and delicious as a reward. During the summer months, having the oven for extended periods of time can make the house feel hot and sticky. My recipe creation for the Inspired by Voortman contest was to make this beautiful and delicious cake that didn’t require any baking at all! It’s perfect to bring out during a BBQ cookout or for a special occasion. Just make sure to enjoy it right away before it melts! Though my creation is strictly for inspiration, I will not be entering the contest! The full printable recipe is below, this is a quick walkthrough. The first thing I did was head to the nearest store that carries Voortman’s and purchased my supplies. 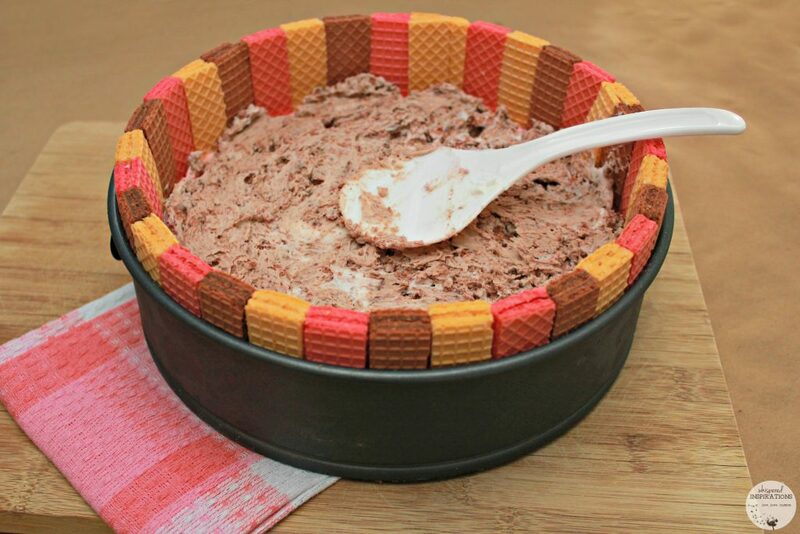 The things you will need are Voortman wafer cookies in strawberry, chocolate, and vanilla, a large tub of Neapolitan ice cream, store-bought buttercream or ingredients to make your own, unsweetened coconut and milk chocolate. Once I had everything I needed, I stood the cookies inside a springform cake pan. I ordered them in my favored color sequence until I had a perfect ring. With a mixer, I churned the first flavor of ice cream. I chose chocolate. I churned it until it was softened but still frozen. Using a spatula, I added the first layer to the bottom of the pan. Then into the freezer, it went to harden! 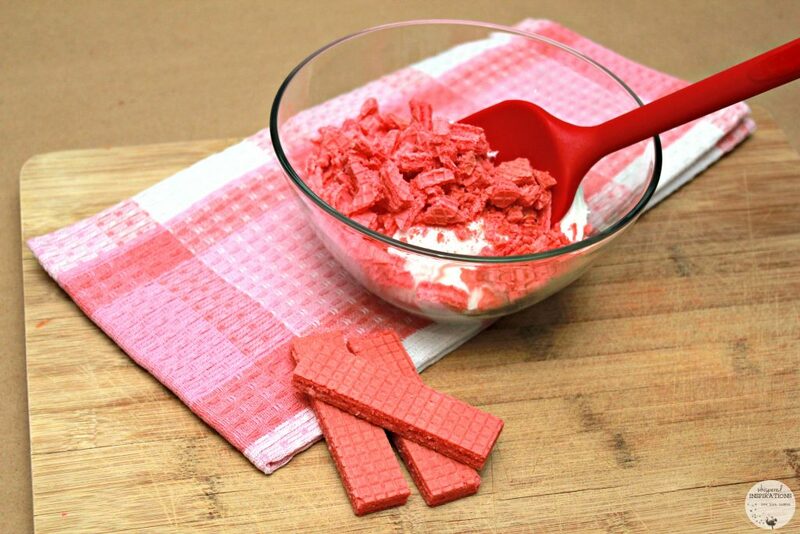 For the filling, I roughly chopped up strawberry Voortman wafers and added them to buttercream frosting. I churned and added my strawberry ice cream layer. I repeated the filling but used chocolate Voortman wafers. Each time placing it in the freezer to harden. I added two more layers of ice cream in vanilla and chocolate and spread it evenly. Altogether, 4 layers of ice cream and two of filling. I then topped it with shaved unsweetened coconut. I spread that evenly on top and then cut a couple of wafers into triangles as a centerpiece and spread shaved milk chocolate around it. Of course, you can top it with anything you’d like! 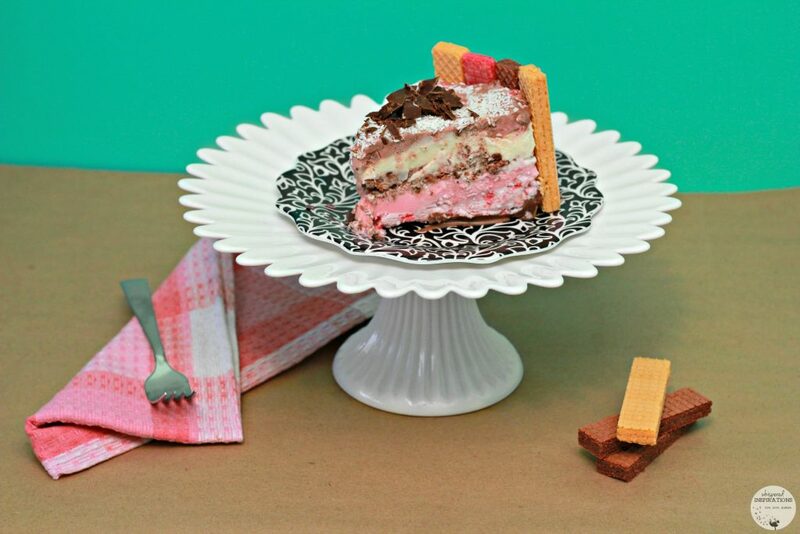 This is a delicious recipe to help you assemble a Voortman wafer creation. Perfect for a special occasion or just because. 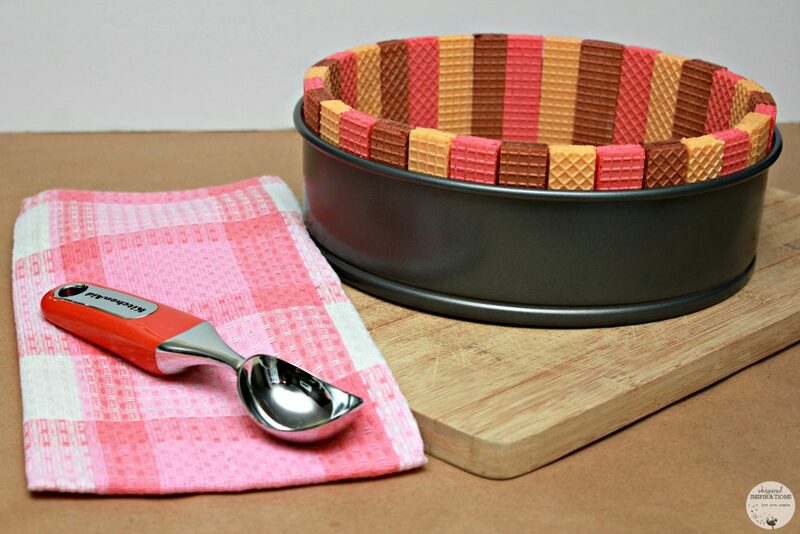 Take your spring form pan and assemble your Voortman wafer cookie ring. Stand wafers up all around the spring form pan in your chosen color sequence until ring is completed. Take mixer and churn your first layer of ice cream (I chose vanilla) and churn until softened but still frozen. Scoop it into the bottom of the pan and spread evenly, place in freezer to harden and while you work on your fillings. On a cutting board, roughly chop about 20 wafers, 10 in chocolate and 10 in strawberry. In two separate bowls, place 1 1/2 cups of buttercream in add each flavor of cookie in each bowl. Stir until completely mixed. Add filling on top of the ice cream layer, spread evenly. Use the same churning and hardening process to complete every layer in your cake. I had 4 ice cream layers and 2 filling layers to make this cake. Evenly sprinkle unsweetened coconut on top. Cover with wrap or foil. Place in fridge for 4-5 hours or leave overnight. On a cutting board, use a knife to chop chocolate or use a peeler to peel chocolate to garnish. 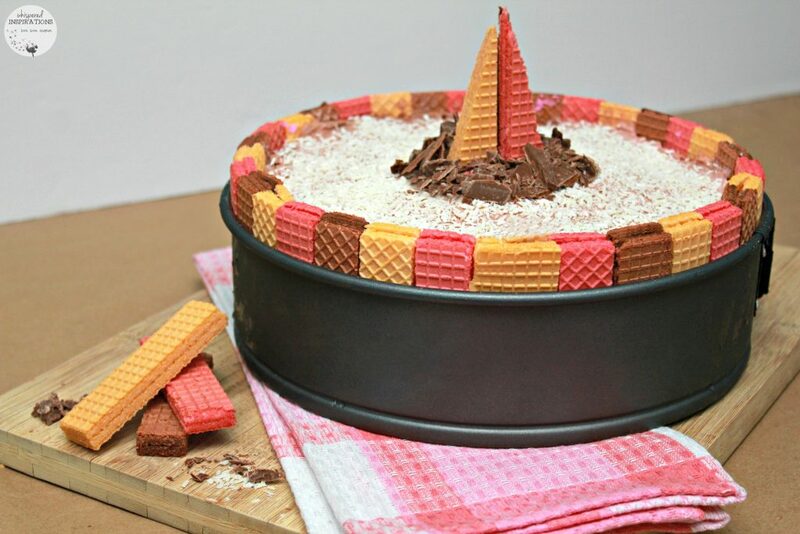 Take 3 wafers and cut into triangles to make crown-like design. The sky is the limit when it comes to topping your cake, have fun with it. Once you remove spring form around the pan, be sure to cut and enjoy immediately! You can freeze for about 4-5 hours and enjoy or for best results, freeze overnight! Remember to enjoy right away, it is ice cream after all and it melts! This cake is super simple to make and the best part is that it does not require any baking! It was a classic twist to the traditional flavors of ice cream. The girls absolutely loved it! Your Voortman recipe creation or structure can be something super simple or elaborate, it’s up to you. The Inspired by Voortman Wafer Contest starts on May 2, 2016 at 12:00 PM EDT and runs until June 13, 2016 at 12:00 PM EDT. The contest is open to all residents of the United States (excluding AZ, CO, MD, NE, ND, and PR) and Canada (excluding Quebec). 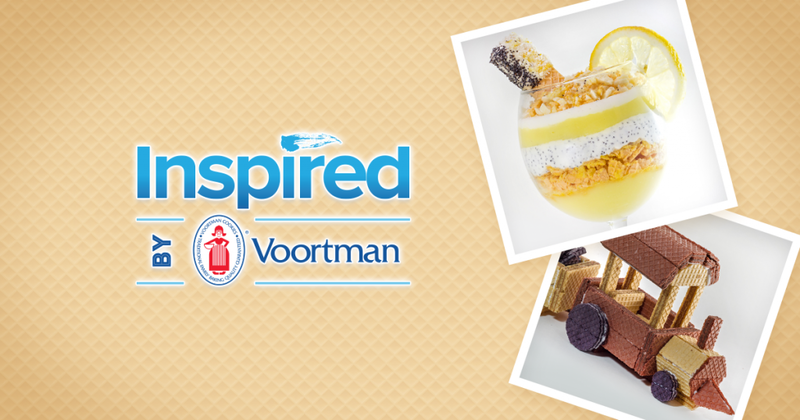 Entrants are invited to get inspired by Voortman, and make or bake a delicious work of art with wafers, and then submit images of their creation online at InspiredbyVoortman.com. Entrants are allowed one entry per day for a chance to win $2,500! There are plenty of Voortman cookie flavors to choose from vanilla, strawberry, chocolate, lemon, coconut, cookies and cream and peanut butter. You can use anything edible to decorate it too! You can buy Voortman wafers all over Ontario in Walmart, Sobeys, Fortinos, Loblaws, Real Canadian Superstore, Food Basics, Metro, Longos, Canadian Tire and Giant Tiger. If you want to check exactly where you can use their nifty Store Locator tool. Remember, that’s TWO winners that can win $2,500 USD! I can’t wait to see what you all come up with! Check out the Inspired by Voortman gallery and be sure to add yours when it is ready! Follow Voortman on Twitter, Facebook, Instagram and Pinterest for the latest updates! What would you make using wafers? Previous Post: « 6 Reasons Why Using Your Own Money Makes Life Better! What a fun contest! Your creation is fantastic! I wish that I could be so inventive. It is very simple, I am sure you can! 🙂 Do not forget to enter yours! OH goodness this looks yummy! I might have to make this someday when I have some free time. Looks perfect for summer. It really is perfect for the warmer months! I have never tried to make a ice cream cake before. I will have to try it out this weekend. I hope mine looks as good as yours. It is actually quite simple! Remember to share your masterpiece, it could win you BIG! This looks so delicious and easy to make. I will have to get the ingredients i need to make one. So glad you like it! Make sure to share a pic in the gallery and enter to WIN $2,500! This is so cool!! And pretty. Love it! My pleasure, hope they enjoy it! My daughters favorite ice cream has always been Neopalatin! What a great twist… Thank You! Oh this looks amazing! I have never thought of making a cake like this, I am sure this would be a hit at our net family get together. Enjoy! Hope everyone likes it! This sounds like a great contest. I will have to enter and see if i can win. Yes, get some cash in your pocket! This looks so delicious. I have never tried to make a cake like this before. I will have to get the ingredients i need to make one this weekend. There is only a few ingredients! Enjoy! This looks so good! I love how simple yet fancy it is! My daughter would love this as a birthday cake! This looks so good and seems easy to make will definitely try this with my 8 year old daughter.. This cake looks so yummy! I love Neapolitan ice cream and ice cream cake. This is basically just the perfect summer dessert! Your ice cream cake is a winner! 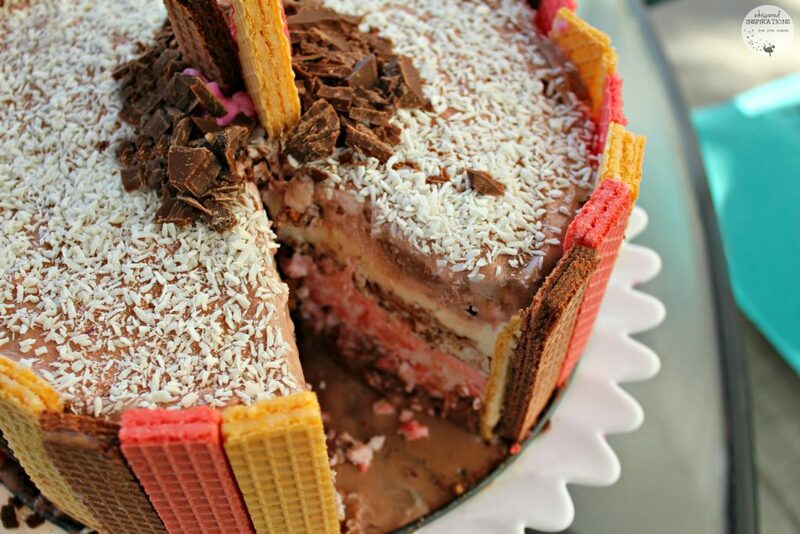 It looks so yummy too, especially because it is made of my two favorite ice cream flavors – strawberry and chocolate, and of course, Voortman wafers! So yummy too. Hope you give it a try! 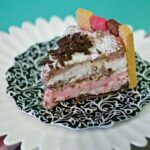 This Neapolitan Ice Cream Cake is an awesome idea and it looks so delicious. 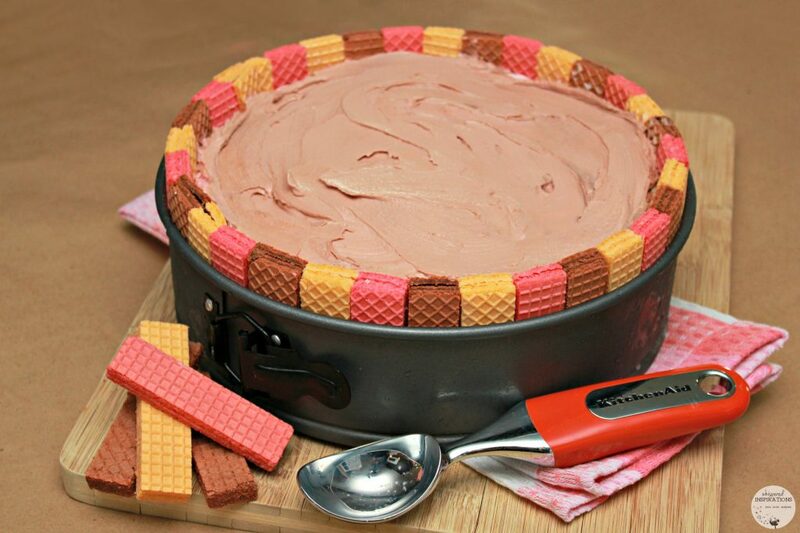 I love the wafer cookies and neapolitan ice cream so this is a perfect cake for me. Thanks for sharing the recipe. What a super cute cake! I love how colorful it is. Omg this cake looks absolutely delicious!!! Something my hubby and daughter would both love. I really should make one for them! LOL, that is so funny. I do see that too! What an easy recipe! Perfect for summer treats! 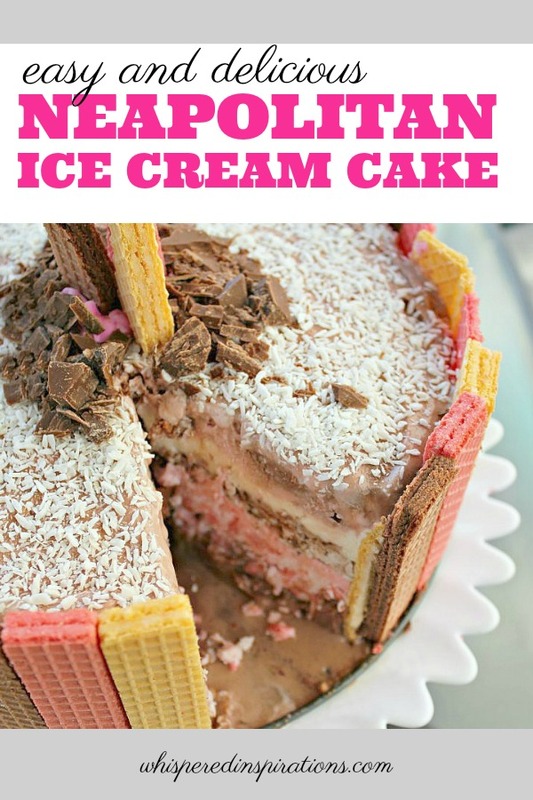 I love Neapolitan ice cream so I can imagine how tasty the cake is. When the grandkids get home next month we are making this….looks so yummy ! I made this will the grandkids sometime ago and they really enjoyed it ! Awesome, it is so good.